Triumphant at the 2010 Latin Grammy Awards, Nelly Furtado, received the “Best Female Pop Vocal Album” award for the very compelling “Mi Plan”, co-written and produced by Brian West. “An album that deserves to win out of sheer musicianship and star power”. Grammy nominated for “Producer of the Year”, Brian West of Track and Field Productions celebrated the triumph of the ‘Whoa Nelly’ album, performed by Nelly Furtado. 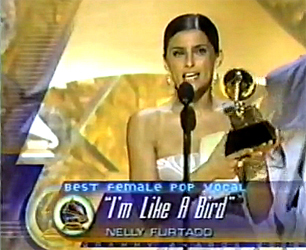 “Pop singer Nelly Furtado, soaring on the strength of her hit song “I’m Like a Bird”, won the “Best Female Pop Performance” at the Grammy Awards show held in Los Angeles”. With the release of Folklore, Nelly Furtado’s first single “Powerless (Say What You Want)” became an immediate smash and was awarded the 2004 Juno for “Best Single”, co-written and produced by Brian West. The Whoa Nelly album earned Brian West and Nelly Furtado four Juno Awards, for “Best New Solo Artist, “Best Single of the Year, “I’m Like a Bird”, “Best Songwriter,” and “Best Producer”. Brian West of Track and Field Productions is instrumental to the signature music produced for K’Naan’s debut album, The Dusty Foot Philosopher, which received critical acclaim and the 2006 Juno Award for “Rap Recording of the Year”. The BBC honored Canadian hip-hop artist K’Naan with a “Best Newcomer” award in its annual Radio 3 Awards for World Music, the album Dusty Foot Philosopher was co-written and produced by Brian West. 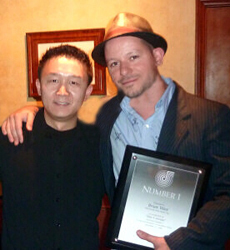 SOCAN was pleased to honor Brian West with a No. 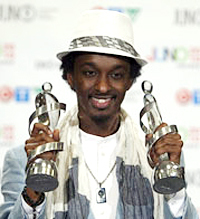 1 Award for the song “Take a Minute,” co-written and performed by K’Naan.